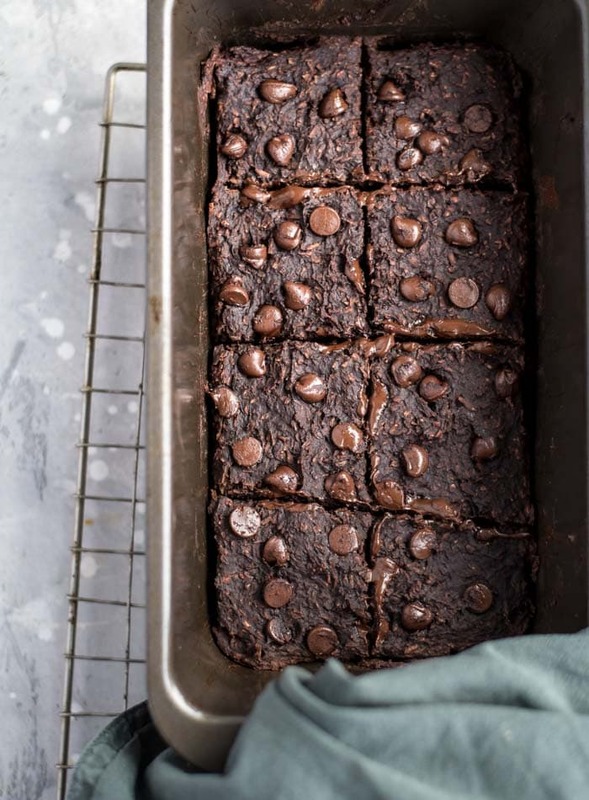 These healthy vegan chocolate coconut brownies are insanely good. Like I-want-to-eat-the-whole-pan dangerously kinda good. 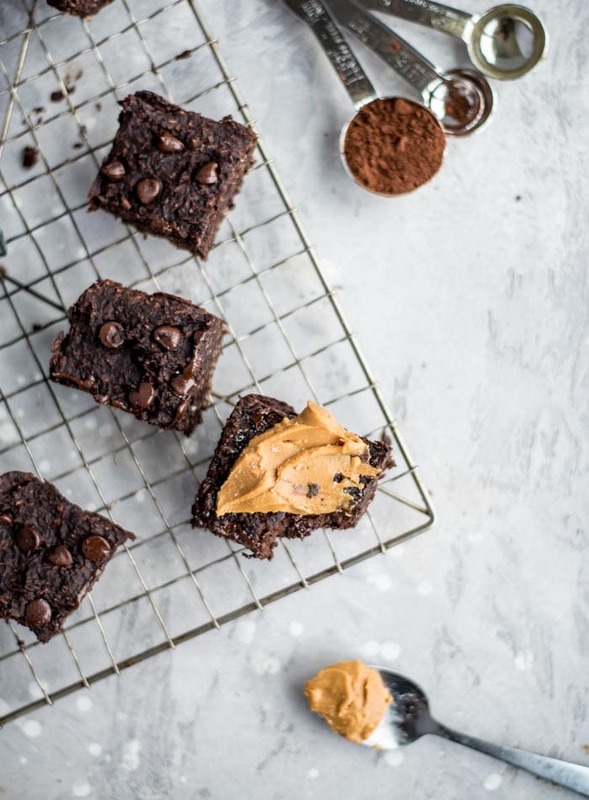 The chewy texture from the coconut, the richness from ripe banana and cocoa powder and the added chocolate chips, these brownies have got it all. 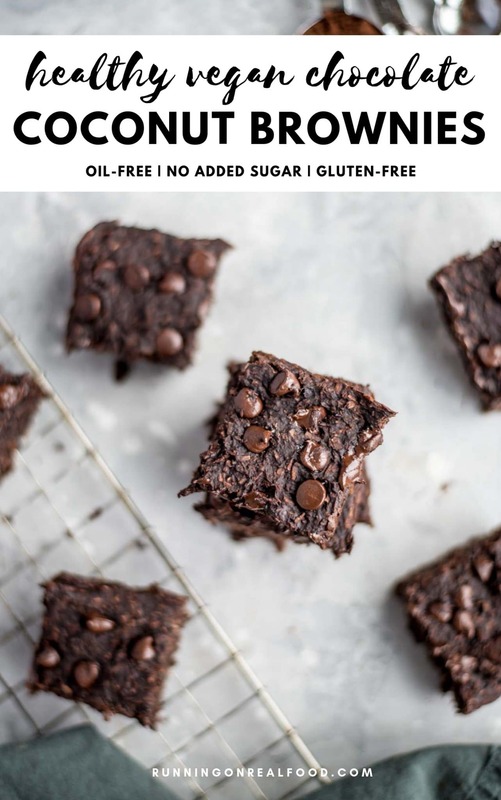 They’re also gluten-free, grain-free, oil-free and have no added sugar. They were a bit of a happy accident too. I was planning on banana coconut cookies but when the batter wasn’t turning out how I wanted, I added cocoa, then chocolate chips and it was looking more like brownie batter and then……oh my god..drool..so good. These bars are a bit higher in fat due to the unsweetened shredded coconut but in addition to being one of my favourite ingredients, coconut is a good source of iron and zinc, both important minerals for plant-based athletes. These fudge-like bars actually make a good pre or post-workout snack thanks to the balance of carbohydrates, fats and protein they contain. If I can get away with chocolate post-workout, obviously, I’m going to! Alright, so first of all, you only need 6 ingredients to make these. Actually only 5 if you skip the added stevia. They take just minutes to prep in a blender or food processor and are made from healthy ingredients like coconut and banana. The recipe is egg-free, dairy-free, oil-free and gluten-free and has no added sugar. 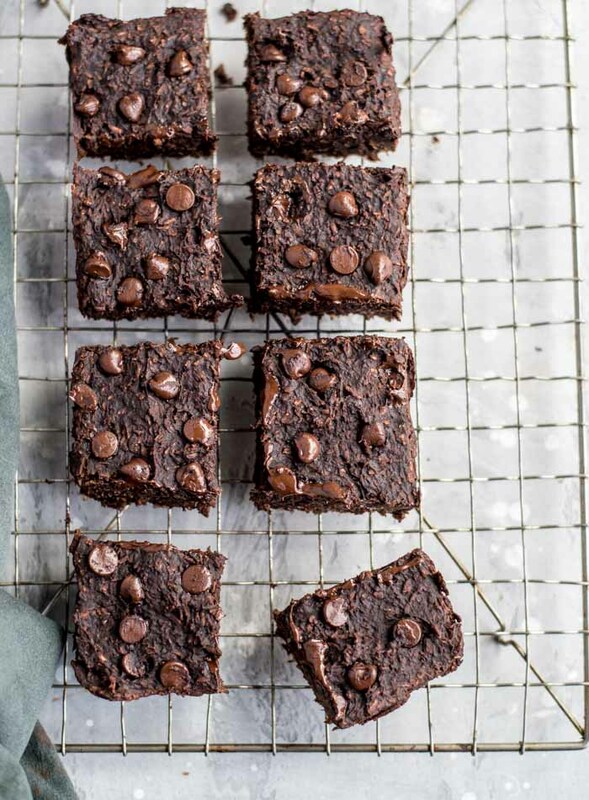 I know, it’s hard to imagine what could be left after all that but what’s left is slightly firm, slightly soft and chewy, rich, chocolate coconut brownies that can be enjoyed anytime of day. These taste like dessert to me but they’re definitely little more healthy tasting than a traditional chocolate brownie. 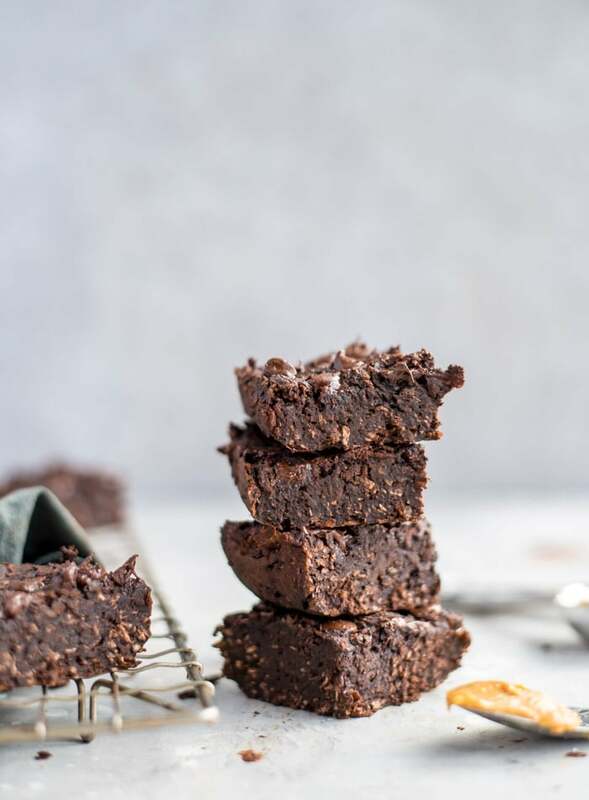 Raw Hemp Seed Brownies // Double Chocolate Raw Vegan Brownies // 5-Ingredient Fudgy Flourless Protein Brownies // Vegan Two Bite Brownies. 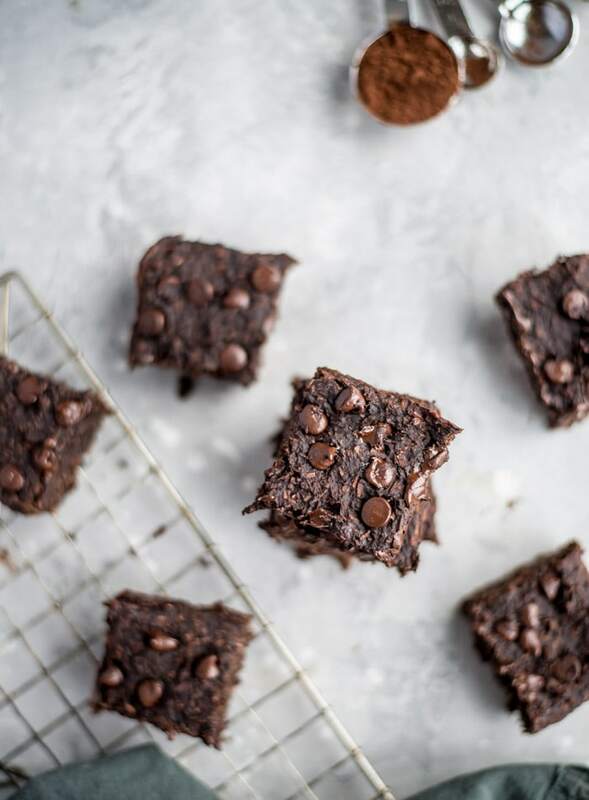 You only need 6 simple ingredients to make these delicious, vegan chocolate coconut brownies. They’re oil-free, gluten-free, grain-free and have an amazing rich flavour and texture. Enjoy as a snack, dessert or even breakfast! Place all the ingredients except the chocolate chips in a food processor or blender and mix until it forms a thick batter. Stir in the 2 tbsp of chocolate chips. Line a loaf pan with parchment paper or spray with non-stick cooking spray then fill with the batter, using a spoon or spatula to spread flat. Evenly sprinkle the remaining 2 tbsp of chocolate chips on top. 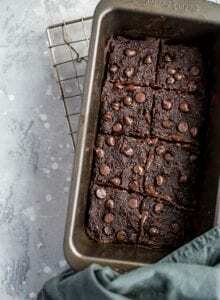 Let cool for a couple of minutes in the plan then cut into 8 squares and gently lift out of the pan. I recommend using a digital food scale to measure your ingredients. Volume measurements can vary greatly, so for best results, use a scale for accuracy. Buy one here. To reduce the amount of carbs and fat per serving, you can omit the chocolate chips, though I wouldn’t recommend this! If you make them without chocolate chips, 1/8th of the recipe will be 14C/11F/5P. I used 1 tsp raw stevia, which is optional but I wanted the recipe to be a little sweeter than with just the banana and protein powder. Sweeten to your own preference using the stevia drops, powdered stevia, coconut sugar or pure maple syrup. If you’re skipping the added sweetener, make sure you have nice, ripe, spotty bananas for the best taste. They’re still really good without the added sweetener. Thanks for sharing these were delicious! I used dark chocolate chips since that’s my favorite variety and nixed the stevia. Came out really good even my non-vegan husband loved it! Awesome! Glad you both enjoy them! Thanks for the comment. holy yum! 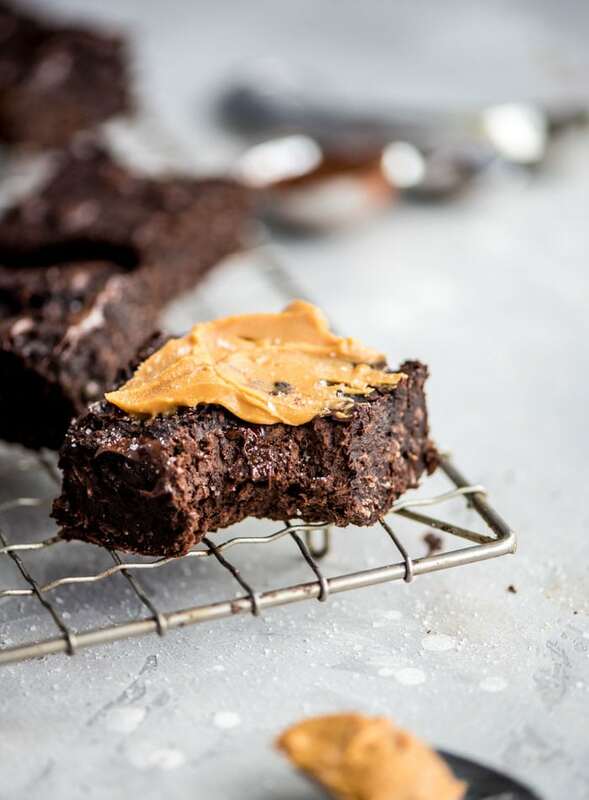 Sometimes mistakes lead to better things, these brownies are an example of that! These are the perfect post workout snack! These look so good and so easy! That melty chocolate…I could go for one right now!! Oh my god those look so good! Will will give these a try this weekend. Thanks so much for this recipe! This looks amazing! Do I have to add the vegan protein powder? is there nay substitute for that? These were a hit with my 5 and 8 year old kids. I made some substitutions with what I had on hand: NOW brand pea protein powder instead of Vega and a tablespoon or two of maple syrup instead of stevia. I’ll likely make them again for the family. Wonderful, so glad you enjoyed them. Any pea protein should work just fine 🙂 Maple syrup is always a great choice, too!